Hello Bead-Weavers! Leah here from Eureka Crystal Beads with a very informative blog for you today! Did you see my newest tutorial video (link below!) that was just posted today? 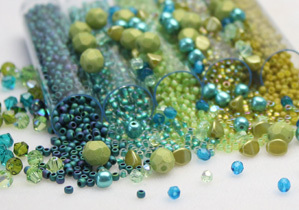 (In it I show you a step-by-step method for creating a Peyote stitch beaded bezel for a 12mm Swarovski Crystal rivoli stone using Miyuki Delica beads, Toho size 15 seed beads, (Miyuki size 15 seed beads can also be used), and Czech size 15 “Charlottes” seed beads. Below is a chart of the bead-counts for that first initial ring of Miyuki Delica beads to create your Peyote stitch beaded bezels! We would love to see what amazing creations you make with your bezeled Swarovski Rivolis!! Please, share on the Eureka Crystal Beads Facebook page – we’d love to let you show off your work and all that you’ve learned!! Until next time, bead on!! Previous Post Products for Summer Color Inspiration!